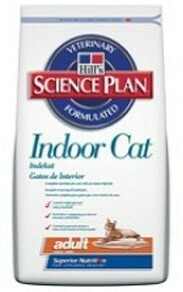 INDICATIONS Science Plan* Indoor Cat Adult is designed to meet the needs of cats that live mainly or exclusivly indoors. Its formulation helps to minimise the formation of hairballs and provide effective control of weight gain. - The high level of vegetable fibre helps to sweep ingestion hairs through the digestive system, reducing their accumulation as hairballs and subsequent regurgitation or vomition. - Providing a nutritionally-balanced food with reduced energy density helps control body weight, and relpacing digestible calories eith indigestible fibre increases bulk and helps to avoid hungar. L-carnitine supplementation ensures adequate levels to help limit fat deposition and maintain lean body mass. - The acidic urinary pH produced and the contolled mineral content help to maintain urinary tract health. For optimal effect Science Plan* Indoor Cat Adult should be fed as the sole food, i.e. not be diluted by mixing with other foods. Science Plan* Indoor cat Adult also contains a Superior Antioxidant Formula to reduce oxidative cell damage. NOT RECOMMENDED FOR 1. Kittens 2. Pregnant or lactating queens. During pregnancy and lactation, queens should be switched to Scince Plan* Kitten. PACKAGING Bags: 400 g, 2 kg and 4 kg 1, 2, 3 For footnotes see page following Formula Types FEEDING GUIDE Many factors such as environmental conditions, activity level, stage of life and induividual variation (temperment, stress) can affect the amount of food needed. Adult cats should be fed only sufficient food to maintain their ideal body weight, in one or two meals per day. Science Plan* Indoor Cat Adult should not be supplemented as such additional may upset the nutritional balance. Fresh water should be available at all times.